The six students – Jasmine Alexia Bajada, Sarah Debono, Tiziana Borg, Samwel Grima, Anna Lombardi Cassar and Bernice Magro at the ceremony, flanked by dean Dominic Fenech and BOV manager Joyce Tabone. 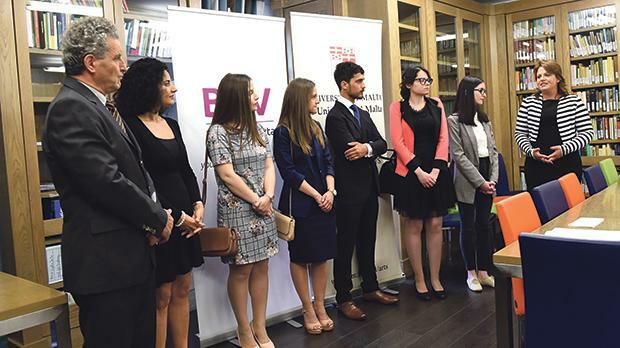 The six best students reading for a degree at the Faculty of Arts at the University of Malta who will be graduating in November, have been included on the Dean’s List and presented with awards by Bank of Valletta. Speaking at the presentation ceremony, faculty dean Prof. Dominic Fenech said that notwithstanding how hard it was to reach the required benchmark of excellence to make to it the list a relatively high number of students were qualifying for the award in recent years, which indicated that at the top end, students’ academic standards were rising. He added that while there were fewer students from the ‘south’ of Malta, such students performed as well as anyone else. Bank of Valletta manager Joyce Tabone congratulated the students on their outstanding achievement. She said the bank supported initiatives that recognise academic excellence and encourage talent, adding that “a good academic preparation serves as the foundation to a successful career, which in today’s world means continuous learning and specialisation”.